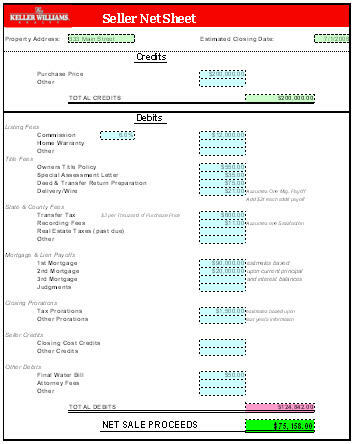 You can estimate your closing proceeds by completing a simple spreadsheet called a seller net sheet. The seller net sheet calculates your closing proceeds after you enter variables such as your mortgage payoff, sales price, sales commission, pending real estate taxes, and closing costs. You can use the seller net sheet to evaluate your marketing options, including different sales commission scenarios.